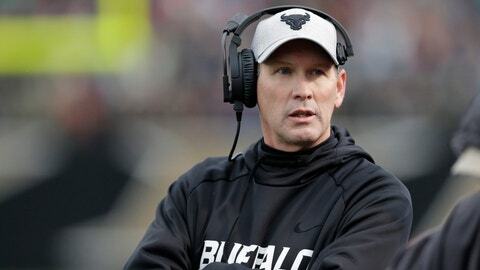 AMHERST, N.Y. (AP) — Buffalo coach Lance Leipold interjected when asked how quickly it took him to turn around a team that went from two victories to being on the verge of winning 10 games for the first time since the university began tracking football records in 1894. “Quickly? I don’t know if it seems like quickly some days,” Leipold said with a chuckle, referring to the two years since the Bulls bottomed out in his second season. Leipold was referring to what was then a raw but talented class of sophomores and redshirt freshmen. The group included quarterback Tyree Jackson, receivers Anthony Johnson and K.J. Osborn and linebacker Khalil Hodge. They now form the core of the Bulls (9-1, 6-0 Mid-American Conference), who are off to the best start in program history and already matched the school record for wins, which was set in 1986 when Buffalo played at the Division III level. The Bulls have gone beyond what few could have envisioned in transforming themselves from long-time pushovers — this is their third winning season since joining the MAC in 1999 — to a formidable powerhouse while getting votes in the national polls. With two games left, starting with a trip to Ohio (6-4, 4-2 MAC) on Wednesday night, Buffalo needs one win to clinch the East Division title and only its second berth in the conference championship game. And the Bulls have all but assured themselves of what would be the program’s fourth bowl berth, including in 1958, when Buffalo players elected not to take part in the Tangerine Bowl because the team’s two black players were not allowed to participate. Jackson hasn’t forgotten how low things became in 2016. “I think that’s something that actually kind of motivates you still,” said the junior quarterback, whose 24 touchdowns passing are five shy of Buffalo’s single-season record. Another motivating factor is how last season ended. Buffalo won its final three games to finish 6-6 before getting snubbed in the bowl-selection process. They’ve left nothing to chance this year. Jackson oversees a dynamic dual-threat offense averaging a little over 36 points and 427 yards per game. One week, the Bulls are winning with their passing attack. Johnson scored three times and set a school record with 238 yards receiving in a 51-42 win over Miami (Ohio) on Oct. 30. The following week, it’s their ground game. Freshman Jaret Patterson had 187 yards rushing and two touchdowns in a 48-14 win over Kent State on Nov. 6. And Buffalo’s stingy defense is allowing a MAC-low 328 yards per outing. The Bulls have won 12 of their past 13, dating to last season, with the lone blemish a 42-13 home loss to Army on Sept. 29. With a 22-24 record, Leipold already ranks fourth among Buffalo coaches in career victories. Before being hired by Buffalo, Leipold went 109-6 over eight seasons at Division III Wisconsin-Whitewater. When asked to put this season’s success into perspective, Leipold reflected back to his first full-time coaching job as an assistant at Division II Nebraska-Omaha. The Mavericks, whose program has since been discontinued, went 1-10 in his first season, 1994, before winning the North Central Conference championship with a 10-2 record two years later. Leipold is doing it again in Buffalo.